Anyone can make a fresh start anytime of the year. Traditionally though, New Year’s Day is when most of us wake up to the beginning of a whole year, allowing us to chart our careers and personal lives as we would want. And so it is with this year’s first issue of INSPIRE. Whereas New Year’s resolutions may not excite us anymore – trite as they may sound – the INSPIRE team has tried to go beyond only publishing excited pledges of exercising or eating more organic food. The result is our cover story. The stories provide for a fascinating insight into this year’s plans of some extremely talented individuals. These are people who have decided to build on what they started out to do, and to move on to the next level. That they may be a notch better than the rest of us shows in their clarity of purpose and long-term commitment to their year-long plans. To celebrate our second birthday, INSPIRE brings to you an opportunity to win exciting prizes! But to those of us who would prefer to read what their colleagues’ New Year’s resolutions are, go straight to page 17! Here’s what you need to do. First, identify ten words which have been highlighted in this issue. And then, use any one of them to describe yourself in a sentence. Make it funny, creative, inspiring or just plain different. The five best entries will win iPod Shuffles, and pictures of the winners and their entries published in our next issue. 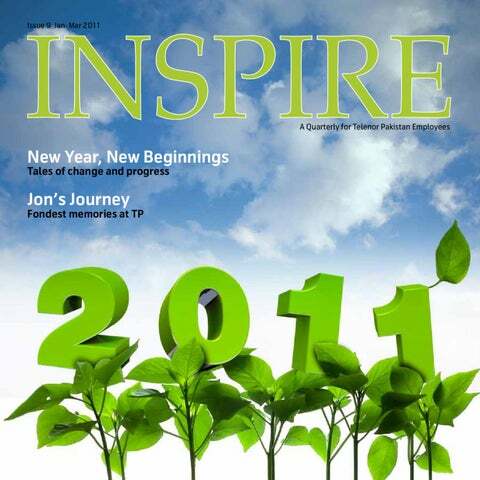 Editor inspire@telenor.com.pk PS: This issue also marks INSPIRE’s 2nd birthday. To celebrate we’re running an exciting competition. Check out details on how you can win. So hurry! Write in, right now for your chance to be a winner! Competition closes May 1, 2011. If you are looking for the biggest fan of ‘Transformers’, you must meet Adil Waheed. A die-hard fan of Jessica Alba and Megan Fox, Adil calls himself a movie buff. A regular INSPIRE contributor from Finance, he keeps his worklife balance tediously scheduled between office and an Executive MBA program. He often surprises friends with home-made pasta when they are visiting. For Adil life begins at 40, and a Ford Mustang is the ride he dreams of. Known for her easy-going personality, Sana Rizwani is a regular contributor to INSPIRE. A food lover and proud of her taste buds, Sana has tried nearly every restaurant in Islamabad, Lahore and Karachi. Ironically, she is mostly found trying to diet over a big piece of chocolate cake. In her alone time, she loves to catch up on her reading and watching sitcoms and soaps. Sana believes that the solution to Pakistan’s problems lies in increasing the education ratio. Her support lies with multiple projects such as ‘Teach for Pakistan’ and ‘Parhay ga Pakistan’. Her dream is to open an animal shelter some day. The venue was Dream World Resort. The occasion S&SC South Team’s Away Day. The theme Rock Star Night. The result: A Night to Remember. Just getting out of the office and spending a few days off work with colleagues is thrilling enough. But give Arsalan Najmi (the coordinator) to manage an away day for S&SC South and you’ll be blown away. Rock Star Night was unforgettable. Participants were given all the essential attire: bandanas, gothic jewelry, t-shirt, peeloff tattoos -- all the paraphernalia you’d need to be a real rock star. And the line-up was incredible: Zainul-Abadin, Jhoot Band, Rizwan Mirza and Mahreen Sayyal & The Disaster Dance Group (who were a riot!) with comedian Kashif Khan acting as host/MC. A few brave colleagues climbed onto the stage and sang the TP version of ‘Yaro Yehi Dosti Hai’. Dreamworld was such a dream. The entire team participated in all the activities: dirt-biking, horse-riding, boating, and laser tagging being the most popular. “It was one of our best days at Telenor Pakistan,” says a participant. The smiles are bound to last the whole year through. Muhammad Fawaz (pictured above) is a radio jockey on SACHAL FM 105. For him, there is nothing like the rush that he experiences right before he goes on air. INSPIRE got a chance to chat with Fawaz about his hobby. INSPIRE: What made you become an RJ? (With a smile) I think I have the required personality traits. With a positive attitude, a good voice and a solid knowledge of music, I am definitely cut out for the role. INSPIRE: What is the show about? Is it a live show? Yes, it is a live music show called Better Living Style. People can call in, ask questions and give ideas and tips. The most fun parts are the live calls because you get to talk to so many people. INSPIRE: What kind of music do you play? Themes, requests and moods determine what is played. I have my own selections but these also depend on the weather and the time of the day. INSPIRE: What is the most fun thing about being an RJ? People recognizing you by your voice and being able to share their opinions. Nothing compares to that. INSPIRE: How has becoming an RJ changed you? This is one experience that has brought out skills that I never knew I had! Now I have greater confidence, better social links and so much recognition. Seventeen pit-stops around the world St. Augustine once said that the world is a book, and those who do not travel read only a page. Passionate about travelling and insatiably curious to discover the world, Muhammad Moosa decided that he wanted to read the book. And so began an extensive travel plan. Seventeen countries on the map were marked out, and once the visas were stamped and the tickets booked, Moosa took off on the journey. He remembers his flight to Makkah as a journey of excited anticipation. “My stay in Makkah was the most soul-refreshing experience of my life,” he recalls. Waseem Ahmed Khan (pictured left) had just cleared his army ISSB exam with flying colors. He was also playing cricket for a local club. And then he lost his right arm in an accident of fate. Running a little late for an evening practice session, he had taken the train that day. Hurriedly trying to catch up on lost time, he had jumped off as the train slowed down near the station. A slight slip of balance and he had fallen on the track. As his reflexes kicked in, he pulled himself up, but only seconds too late. His right forearm had been completely crushed. Waseem does not appreciate it when people give him special treatment. For him, will power and dignity are his biggest assets, and he believes in himself now more than he ever did. The doctors had told his father that the arm had become septic and they would not be able to carry out the much-needed micro surgery. Amputation was his only hope. With dreams to join the army and a passion for sport, Waseem has emerged from this unfortunate incident with so much positivity that it is incredible, says his colleague, Tania Khan. “I taught myself to write with my left hand within a month as I had exams to take,” he says. “The experience has taught me that great things are possible only if you believe in yourself.” One year on, recovered, and with an eye on the future, Waseem is set to go places. Salman Saleem (pictured right) is one face behind h2h who has plenty to say about the application that is the lifeline for most of our business requests. of the speedboat riders pointed towards three team members and shouted, “Look! They’re sinking!” And yes, they were. Noman Kabir, Farrukh Sheraz and Ali Ibad had been under for no longer than a few seconds before they were pulled out. Wet and cold, they laughed as they got out of the water and were instantly ready to go back for more. Zeeshan Abbas and Abdul Qadir Kharadi were the most successful aboard the banana boat, and were met with applause once they emerged from their grand cruise. Memoona loved parasailing of everything she did. “All of us sailed 300 feet high. Imagine the rush!” she says smiling. With a captain steering them through it all, they believe that without his timely shouts, they could never have done so well. running against time; launching a module is one of our biggest challenges. It’s like sending your child for the first time on to a stage, and then worrying how well he or she will perform,” he says with a laugh. Salman believes that h2h is headed toward greater things, under the umbrella of Employee Services. spread to other OpCos, to bring them greater benefits. “With h2h, my dreams have also grown bigger as I realize the kind of things that can be made possible.” Kudos to Salman and h2h for making our lives so easy! Will pink make her think? For every nine women in Pakistan, one will suffer from breast cancer at some point in her life. Whether she survives or not depends on how soon she finds out. Awareness is key. To show support to those affected by the condition, the women of Telenor Pakistan’s Islamabad office decided to wear pink for a day. They dedicated October 20 as Pink Day and invited Health, Safety & Environment’s own in-house Dr Fatima Raza to tell them about detection and prevention. Over a very informal setting and tea and cookies she told 50 women participants about the common myths and different types of tests that need to be performed. We all gaped at how patients had the highest chances of survival, provided a woman was aware and conscious of the steps to take following detection. Awareness is empowering, and in this case can save a life. To get more information on the disease, please contact the Health Care unit at health.care@telenor. com.pk. MOHAA moment of victory Muhammad Bilal Khattak loves MOHAA – the computer game that needs you to be on your toes when you play. He talks about the game as a passion he cannot usually find time for but is thrilled when a chance presents itself. “It was simply amazing when I got a chance to play the MOHAA championship tournament in RO Peshawar this quarter,” he says. “We were 25 players from different departments with a single goal. And while it was a tough run, we had the time of our lives!” he recalls. were left. And then began a series of contests among the last six survivors. “We played a Best of Five and there was silence in the room as we challenged each other in a virtual world,” Bilal remembers. “A nail-biting wait for those who were watching. I won the championship 4-1, an incredible victory for me and a great confidence booster. “I cannot forget the pressure during the game. Right in the middle I thought I was going to lose but presence of mind and quick reflexes kept me going,” he says. Kudos to Telenor Social Club for arranging fun activities in the regions. And more power to Bilal! (From top to bottom) Internet patro l arrives at Rendezvous looking for the five fugitive characters; on the loose; Jack Sparrow has been The five characters are seen; His photographs have been taken by the crowd and are being uploaded to the site; Simultaneously Maula Jat has been spotted and is being captured on camera; The activity continues. Onlookers are always awestruck at the sight of a new-born baby, but no one remembers the noisy ordeal the poor mother goes through to make it happen. Such was my experience. Although I was not the mother but ‘internet.more Most Wanted’ project is the fruit of the labor of many. I being the kitten among the cats took it upon myself to act anxious all the time. I was pushed into the meeting room (read labor room) by my seniors on the second day of my job a few months back. What ensued involved a lot of running around, a lot of hair pulling, and a lot of meetings. Coming up with a solution was the call and we were to do this with an element of beauty and innovation as is normal for all marketing activities. I wanted to find the person who had told me marketing was easy. Seriously. After much ado, we came up with an idea. And I must say, they don’t lie about the Telenor culture. True to the word, everyone was extremely helpful, especially the ‘big boys’ from Marketing. I don’t believe anyone was expecting the response we received during the pilot of the activation. I showed up late at Civil Junction (an eating hangout for Islamabad youngsters) only to be received by the broad smiles of the team. It was like thunder without the rain and rumbling. Kids were going crazy clicking their cameras, chatting, laughing, and generally having fun. We all felt relieved that night. The idea had become something real. The race is on to get more people to internet.more! awab is a lively, mischievous 11-year-old at the Idara-eTaleem-o-Agahi (ITA) Child Drop-In-Center (DIC) in Rawalpindi. His family was displaced from Swat and ever since he has been ragpicking to help out at his father’s tandoor for the past five years. “Promise you will come next weekend?” is the one question he unfailingly asks every Saturday of Palwasha Sherin Khan, who volunteers at the center. The same words are echoed by the children at the other ITA centers in Islamabad, Rawalpindi and Lahore where Telenor Pakistan employees chip in a few hours of volunteer work every Saturday. Muhammad Usman Hasan and Sara Usman have loved their experience so far. “We get the children color pencils and coloring activity sheets which they really enjoy. The most rewarding is when we arrange a magic show for them. We bring back so much with us from our sessions, it would be hard to put it into words,” says Sara with a smile. Atif Sheeraz Khan Lodhi, another volunteer at one of the centers, did not expect the children to be so talented. “I am surprised to see how brilliant these kids are! All they need is a bit of support to become a valuable part of the community. It really is that simple,” he says. Karl’s Top Five Karl Erik Broten likes to eat at Cave, BBQ Tonight and Monal. Ahmad Amin, a volunteer at a DIC, spent the first day of 2011 with the students, organizing a Picture Day, showing them pictures of famous buildings and teaching them history. He calls it a beginning he will remember for a long time. “What do you want most for 2011?” asks Palwasha of the children at the Rawalpindi center. “To visit Islamabad just once,” says Neelum wistfully, a 10-year-old who helps her grandmother clean houses after the center closes each day. Chaudhary Shahid Ali, after his experience with volunteering, has realized that children lose out on a normal life when they are compelled to work for a living. management of all networkrelated issues. In many cases faults are rectified even before the customer realizes degradation. Telenor Pakistan’s network stability largely depends on timely resolution of issues from NOC, which in turn results in customer satisfaction. 3. What is the immediate goal? NOC’s immediate goal is flawless network surveillance round the clock, real-time fault escalation and proper follow-up of issues till resolution. NOC is also the owner of change control management for all network elements. Over the past two years we have been able to reduce half the workload through automation; our target is to reduce it further. 4. What is the biggest challenge? The biggest challenge is to maintain high network quality during the current power crisis and the prevailing security challenges in the country. We believe that this is only achievable by balancing our workload through continuous process optimization and 9 system automation. INSPIRE catches up with TCD to ask them about their achievements, exciting beginnings and future plans. Technology Competence Development (TCD) has only recently become part of Organizational Excellence but since the very beginning the department has been setting precedence for excellence. A testament of that is the recently awarded recognition of ISO 10015-1999, a quality management standard for training. Telenor Pakistan became the first company in Pakistan to receive this recognition. Having begun operations in August 2009, TCD are proud of their successful run in a year’s time. And what a run it has been. A sneak peek behind the scenes TCD has been busy for the past one year. Looking at process improvement and system development, ideas have become projects and then initiatives. What does the TCD team do? To answer this, we took a sneak peek into their responsibility functions. One key area for the department is Functional Competence Development of divisional personnel. The brainchild of Khalid Shehzad, Chief Technology Officer, TCD came together with the vision to take capacity, performance and development to new heights. Not willing to fall short, the strategy of the department focuses on competency framework, and a knowledgerich environment. A big claim for most but one that has already been set in motion for TCD. A wide-range of training courses has been planned for 2011 through the Technology Knowledge Sharing Program. Proudest moment in TP…	When we won the ‘Best Performing Group Company’ in 2010 recognition for the team that had performed in tough conditions. A song that sums up your TP experience… ‘Home’ by Michael Buble. The lyrics are more about my feelings being away from my wife and children. Most awkward moment… Launch of easypaisa and giving a statement in front of 30 microphones. Speaking in English in a fully Urdu environment. My TP colleagues should… …continue to leverage the culture and way of work we have. We have proven it is the sustainable difference. Saad is part of the Technology Strategy team and has been working with telecommunications for the past 12 years. He has been one to keep an eye on upcoming trends in the industry and recently shared the knowledge he has acquired by writing about it. He has published two books: ‘Wireless Communications Evolution to 3G and Beyond’ and ‘Next Generation Mobile Communications Ecosystem.’ 2011 brings continuity to his newfound passion for writing and so much more. Mahreen believes that while a serviceoriented job is tough, it is also one of the most rewarding experiences. She has learned the tricks of the service trade with OSS and has been very excited about the integration of h2h and OSS into 323 – and, more recently, Employee Services. She believes 2011 will bring the Employee Services team even better integration and a more unified purpose. has decided to take change head on and looks forward to 2011 as a year of exciting times. – Hina Iqbal, Ayesha Sajid, Sohaib Mustafa, Palwasha Sherin Khan, Sana Rizwani, Tania Khan, Farhan uddin Muhammad Khan, Mariam Hussain Randhawa and Memoona Qadeer contributed to the research and writing of this article. Writing is an art that needs to be molded and shaped to really make a difference. My writing has gone through a number of pit-stops and mentors. Be it reporting for an English daily like The Nation, an editorial position with a fashion magazine like Niche, feature writing for Dawn or the column of the Sunday Magazine, I have learned from experience how to take on different styles of writing and express myself. A writer at heart, I believe that expression is a need that everyone is born with. One of my learning grounds for the past seven years has been the forums of www.desiwriterslounge.net, a community of South Asian writers that sprouted from a chance meeting of like-minded people on an Orkut writing community. Later, the community took the shape of the website where forums of discussion and registration processes for memberships were introduced. Ever since, the expertise of the writers at Desi Writers Lounge (DWL) has grown, and with it the hopes of the founders who had set the idea of an online writing community in motion. With 350 writers from South Asia as members, DWL is a place where you build writing networks and learn to bounce off concepts for poetry, drafts for short stories and learn about other genres of writing. As a founder of the website, I have been involved with the establishment of the community and have also recently taken up the position of Associate Editor for its e-zine, Papercuts. To lose 40 lbs, to maintain a work-life balance, to take dance classes and to publish my cookbook. Live, laugh and stay happy. Sunila Saqib Drink more water, be more punctual, stop ignoring SMS’s and start replying, stop missing weddings, wishing people birthdays on time and a lot more. Sarah Nasir Live each day as if it’s my last, smile more often , forgive and forget. Saba Farhat In 2011, I will exercise more! Palwasha Sherin Khan My director set the direction for me this year. I will not stress about work – ever! To get closer to God. Saad Warraich To win the Telenor Football Tournament and not drop a single set in tennis in 2011. To push myself out of my comfort zone. Bushra Dawood I have decided to give my tailor a whole new perspective and fill his head with such innovative and amazing ideas that he will be a certified designer of “unthinkable clothes” by the end of 2011. Spend at least a month away from all ‘smart’ devices and iStupidity (essentially anything that starts with an ‘i’). Live a social-networkfree life. Zunaira Elahi Work on the introvert in me and socialize more. Still need to figure out how to do this though! Umar Jamal Quit smoking (every New Year’s resolution), stop exercising (it’s a waste of time and energy). And stick to my resolutions for more than a week. Iqra Rehman Getting a job with Telenor Pakistan was my New Year’s gift. I want to grow and progress in the coming year. Score more goals in football, fly to Mars, listen to Mom when she says I should marry now, kick my job and become an entrepreneur, organize my socks, give more hugs, read the directions first, date Katrina Kaif, be innovative with excuses and count my blessings. Salim Khan To get more involved in photography, read more books, watch more movies, spend more fun time with the kids -- and achieve a better work-wife balance! Saquib Ahmed travelled across New Zealand in the summer of 2010. He calls it “a massage for the soul”. “I travelled through dense forests, grassy plains, seaside, snow fields and a 60km desert. It was a wonderful trip and I came back home humbled and grateful to Allah for this great opportunity.” “After staying in Auckland for two months, I travelled to Wellington through a desert road. It was really easy to interact with people in Auckland as many of them can speak Hindi/Urdu, which is the most commonly spoken language after English,” he recalls. Attractive aspects of Auckland are its mild climate, plentiful employment and educational opportunities -- and numerous leisure facilities. For quality of life, Auckland currently ranks 4th in the world. An explorer by nature, Saquib found New Zealand a delight for the senses. He speaks with a lilt in his voice of the long evenings on the beaches, the soothing environment, and the small music concerts in the park. INSPIRE spoke with Mahmood Zafar, Director Business Planning and asked him: If given a choice, where would you live in the world, why? Terengganu in Malaysia, because of the simple life it offers. If you could be a car, which car would you be? My childhood love - Morris Minor! What did you want to be when you were 10? A Chartered Accountant! The one movie you can watch over and over again? The Count of Monte Cristo -- an adaptation of a novel by Alexander Dumas is a hot favorite. I love it because of its old-fashioned quality and irresistible bold undertones. You would like to be remembered as… A good son, a good brother, a good father and a good friend. If you were elected the President of Pakistan, what would be the first thing you would do? Relocate Pakistan’s defense budget to education! Make education compulsory for all. If you had a time machine, what time in history would you go back to? Go back to the time before The Big Bang to see what was there. If you had Aladdin’s lamp, what would be your first wish? A healthy, happy and peaceful life. Dancing on the mountains, thatâ&#x20AC;&#x2122;s what our time out does for us! Dining Out Where to eat? Mocha Coffee - Street 3, Kohsar Market, F-6/3, Islamabad What to Order? Their Frappes and smoothies are to die for. Another must have are their cold sandwiches. friendly and helpful and you will be at home, right away. With a diverse platter of desserts and scrumptious coffees, the café is just the place to catch up with friends. You can also take your corporate guests there, work on your laptop or just read from their wonderful collection of books while sipping your coffee. 1. Vital Signs - Yeh Sham The song is more than 20 years old and it’s still so fresh. Amazing lyrics! 2. Bono & Gavin Friday - In the Name of the Father Reminds me of one of my favorite movies! A must watch for Daniel Day Lewis fans! 3. Strings - Titliyan Every time I hear this song, I’m reminded of one of the best music videos made, honoring our artists from TV and the film industry. 4. Bumbu Sauce - Mojambo Creativity at its best, this is one song that Omar Moeen Malik I have been unable to get out of my head since I heard it first. Needless to say, this song didn’t take more than a few hours to make. 5. Singh Is King - Teri Ore How is it possible to make a list without at least one Katrina song?